Cité Mirabel is an ambitious mixed development project of 18,000,000 sq. ft offering all amenities of large urban centres (including the first Premium Outlets in Quebec), in a lush setting that has become a Laurentian trademark. 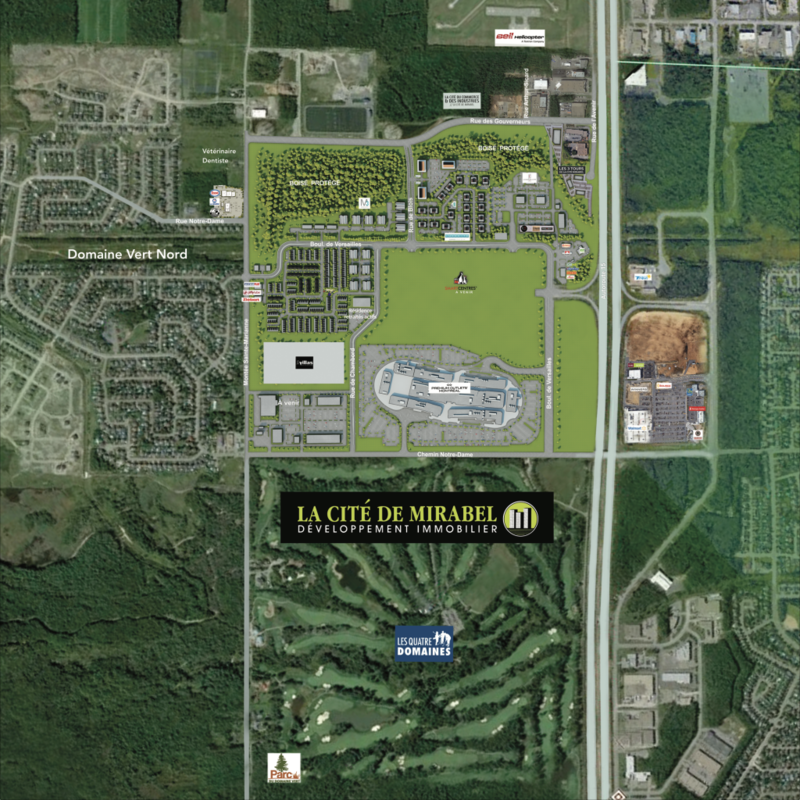 Whether to live, establish your business or go shopping with your family, Cité Mirabel is the ultimate destination. The largest integrated development project in Quebec with more than 18,000,000 sq. ft. Location offering you exclusive access to renowned Premium Outlets Montréal. 1,200,000 sq. ft of commercial, industrial and office space available. Construction of more than 2,500 new residential homes. More than 4,000 workers in the vicinity. Well located at the Cité de Mirabel’s gates, near access roads to Highway 15, Exit 28, the Cité des Affaires de Mirabel (business district) will offer a dynamic environment in which, beginning in 2015, restaurateurs and shopkeepers will be able to provide their clients with a unique consumption experience. Unique in the region, this 140-room hotel is part of one of the largest hotel chains in the world and will offer an incredible experience to the corporate clients of the Laurentian region and Cité Mirabel visitors. Whether to hold your corporate meeting, or find accommodations for your business trip or a single overnight stay with your family, the Cité Mirabel hotel will always welcome you with great expertise. The business centre certainly takes up a central position in this strategic location of the Laurentian region. Its location offers exceptional visibility thanks to the 148,000 cars that travel daily on Highway 15, at Exit 28. Also, a parking space ratio higher than urban standards has been incorporated. In short, nothing was overlooked to make of the Les 3 tours centre THE business centre of Montreal’s North Shore. The Halte routière Cité Mirabel is one of the largest rest stops north of Montreal. Since June 2014, it offers six restaurants and a Petro-Canada gas station. Constantly growing, the Cité Mirabel has other surprises in store for the near future. Whether to stop for a quick meal or simply refuel, La Halte de la Cité is an important stopping point for the 148,000 drivers passing daily through Highway 15. The Cité du Commerce et des Industries de Mirabel is an audacious project aimed at creating a commercial and industrial park meeting the specific needs of innovative companies. Whether to find a condo or fully establish your company, this zone at the heart of the development of Cité Mirabel and near all services will be able to meet your employees’ needs. Located within Cité Mirabel, right in the heart of a remarkable site, several residential projects perfectly combining all the advantages of the city to the benefits of nature are underway. You will fall under the spell of this unique environment bustling with activities. Contemporary and innovative architecture, layout both trendy and comfortable, simple and elegant style, bright and lush environment, all combine to promote this audacious project. Seeking a home that shines and stands out? The Cité Mirabel has what you want! With their glamorous and friendly atmosphere, you will be charmed by one of our projects. Whether to sit back and enjoy life near the pool, keep fit at the gym, relax while listening to your favourite music or have a drink with friends, you will happily stop there. The Complexe Médical Cité Mirabel is directly connected to the historic turning point in Quebec’s healthcare system. Service decentralization, all-round care for patients and interdisciplinarity are its essential pillars. This state-of-the-art clinic was designed around the patient, for the patient. Furthermore, it is worth mentioning that, with its 68,000 sq. ft, the Complexe Médical Cité Mirabel will be among the largest medical clinics north of Montreal. Construction on the project: A unique condo design within a modern 16-units building with indoor parking and a clubhouse at the centre that includes a pool, large terrace, gym and rest room where you can enjoy life. Construction on the project: Townhouses with an urban style, each one offers several advantages: parking garage, ceilings of 9 feet on the first floor, hardwood floors and stairs, 2 or 3 bedrooms, lawn installation, paved driveway and installation of gutters. © 2018 - La Cité Mirabel. All rights reserved.